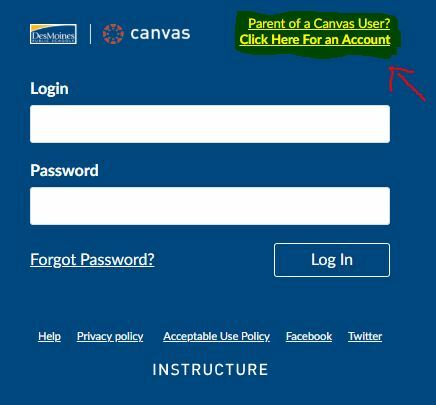 Download your Canvas Parent App on your phone or tablet. This will automatically filter results and specific schools as you begin typing Des Moines. Fill in your name, email, and create your own password. It will then ask you for a pairing code, this is where you will need your student. The Pairing code will come up on their screen. Type the pairing code into your phone/tablet to gain access. If you cannot get the pairing code to work, any teacher or administrator can also create a pairing code for that student. Please reach out to one of them for help. It will then ask you for a “Student Pairing Code,” this is where you will need your student. The pairing code will come up on their computer. Type the pairing code in on your browser, and click “Start Participating” to gain access.